A copper alloy fragment from a barrel tap of 18th-19th century date. The object is cylindrical and each end is open. The body is decorated with shallow grooves, extending lengthways but at a slight curved diagonal. One side of the objet has cracked apart. It has a mid-green patina. 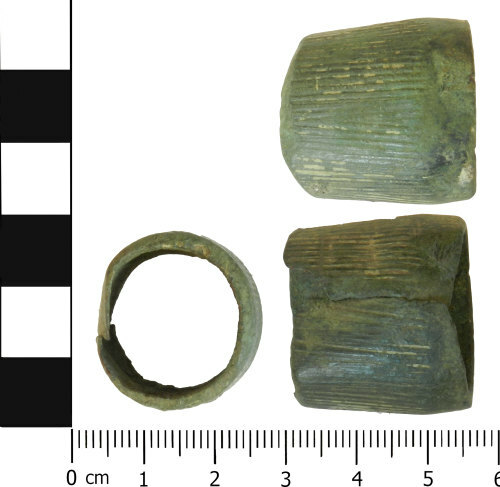 Similar ribbed or grooved examples which can be found on the database are WAW-143274, https://finds.org.uk/database/artefacts/record/id/585418 and SUSS-03B1D3, https://finds.org.uk/database/artefacts/record/id/181978. Dimensions: 23.06mm in length, 22.96mm in width, 17.2g.